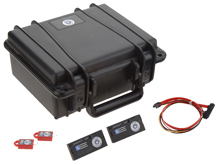 DiskCypher from Intelligent Computer Solutions can minimize the risk of a compromised key through the use of Hardware Key Dongles making it more secure than any software-only solution on the market. 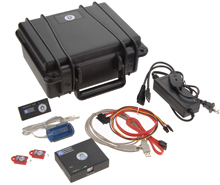 DiskCypher is designed to work transparently with Solo-3 Forensic Acquisition Device using all DiskCypher Key Management options. The Secure Key Dongle option allows the device to be used with other data collection units as well as any regular PCs. 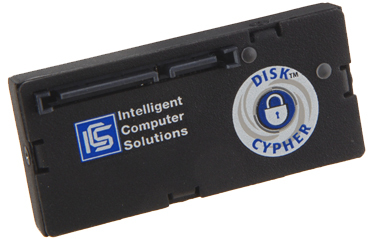 DiskCypher performs at SATA speeds and utilizes the AES 192 bit NIST approved algorithm.
.: Key Loader System: The Key Loader System is combination hardware and software tool that manages key codes and programs it into the DiskCypher Key Dongle. Unique to DiskCypher when used with IM Solo-3 the Corporate Key is a paid option with activation key that is used at the time of encryption.
.: Easy way to protect digital evidence: DiskCypher provides an easy way to protect digital evidence by encrypting the evidence hard drive during the acquisition process.
.: AES 192 bit Algorithm: DiskCypher utilizes the National Institute of Standards and Technology (NIST) AES 192 bit approved encryption at SATA speeds.
.: SATA connection: Connects throught a SATA connector to Host/PC and with a second SATA connector to an "evidence" hard drive.
.: No external power supply needed: The unit utilizess power from the SATA connector, it does not require an external power supply.
.: Encryption Verify Feature: When used with the IM Solo-3, the user has the capability to utilize the Encryption Verify Feature. THis feature allows the user to verify that the digital data was encrypted with the right key at the time the data acquisition and encryption minimizing human error.
.: Can be used with any regular PC or other data collection devices: Depending on the security requirements, DiskCypher can also work with regular PCs or other data collection devices to encrypt either Linux DD images or complete 100% images of hard drives.
.: External Key/Key Dongle: User has the option to connect an "External Key/Key Dongle" device directly to the DiskCypher to conveniently encrypt/decrypt the digital evidence hard drive.
.: Highly transportable: The DiskCypher is a compact size device.
.: Affordable: Economical and cost effective.